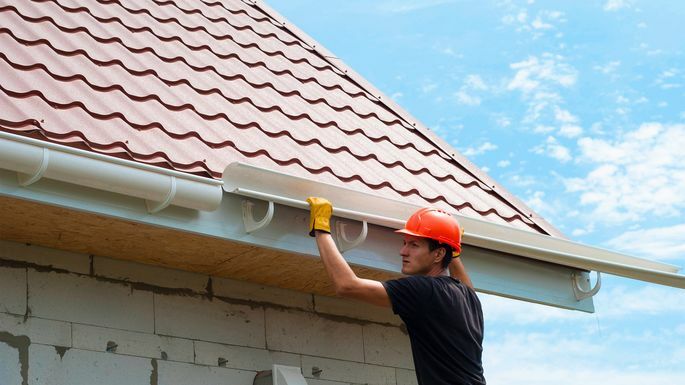 Knowing how to install gutters can pay off big-time, saving a homeowner from water damage during the time of year when the weather is at its nastiest. Essentially, gutters divert water and snow off the roof and away from the house, says Matt Michaels of Lowe's Home Improvement in Charlotte, NC. "Gutters safeguard and improve the look of your home," Michaels says. "Without preparing your roof using properly installed or clean gutters, storms and natural disasters could wreak havoc on your home exterior." Most experts agree you should consider hiring a pro to install them. But if you think you're up for the task, it can be done—just know that it's a job that will fill up a weekend. A typical ranch-style house has around 200 linear feet of gutters, according to Andrew Hecox, owner of Air Capital Roofing and Remodeling in Wichita, KS. So for our purposes, let's look at the costs based on this estimate. The cost of plastic gutters is about $3 to $5 per foot, while aluminum gutters run about $4 to $9. Therefore, the cost of materials alone would be around $600 and $1,800 respectively. Gutters are typically sold in 10-foot sections in home improvement stores. But experts advise paying a bit more for seamless gutters, which do not have to be pieced together and thus have fewer leaks. However, there is a very expensive drawback to going this route. You will need to use a gutter machine, a $6,000 piece of equipment that produces seamless, custom-fit gutters. Most gutter contractors own gutter machines, so Hecox suggests asking a gutter contractor to make seamless gutters for you to install. "A gutter contractor will form your gutters for less than $1 a linear foot," Hecox says. Now this is way more realistic than buying an expensive piece of equipment you'll use only a couple of times in your life! 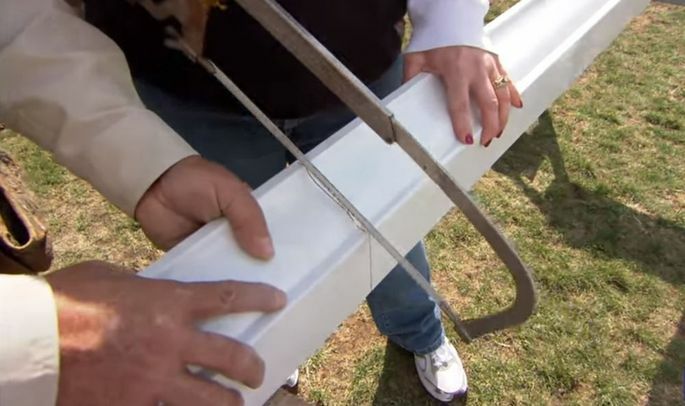 Installing gutters is usually a two-person DIY job—so it's wise to call a handy friend to help. Before you do installation work, determine how much gutter you'll need, says Dave Lincon, director of product management and business development for Sears Holdings Corporation, Home Improvements. Measure horizontally across the length of the fascia. Then measure each of the vertical areas for the downspouts. 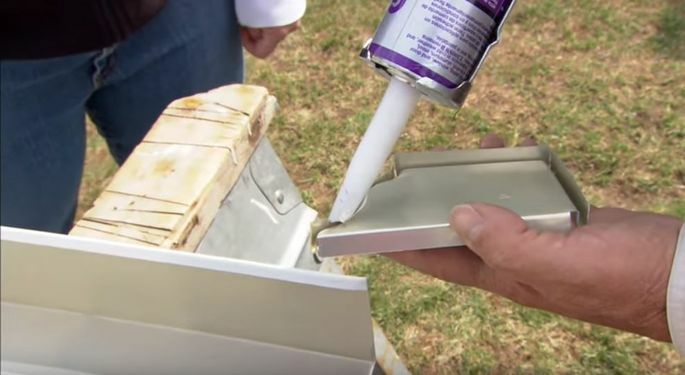 For each run of gutter, apply a bead of gutter sealant with the caulking gun along the inner edge of an aluminum end cap. Tap an end cap onto one end of the gutter. Secure the end cap with a crimping tool. 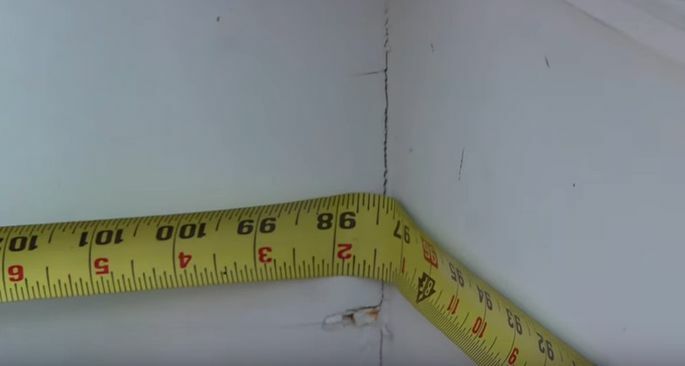 Measure the length of the gutter, and mark it with a permanent marker. Cut the gutter to length using a hacksaw or table saw, and tin snips if necessary. 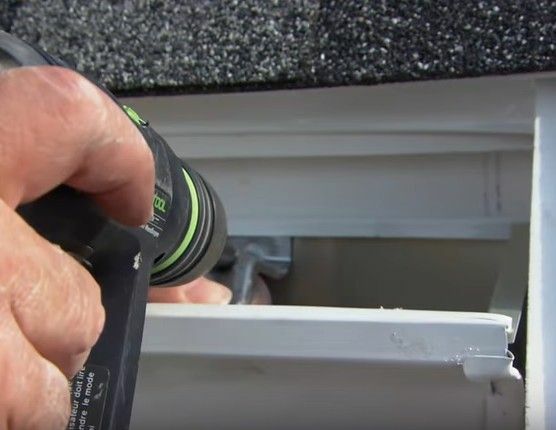 Beware of making too many cuts, Lincon says, as one of the most common mistakes of DIY gutter installers is "using too many pieces and creating too many leak points." 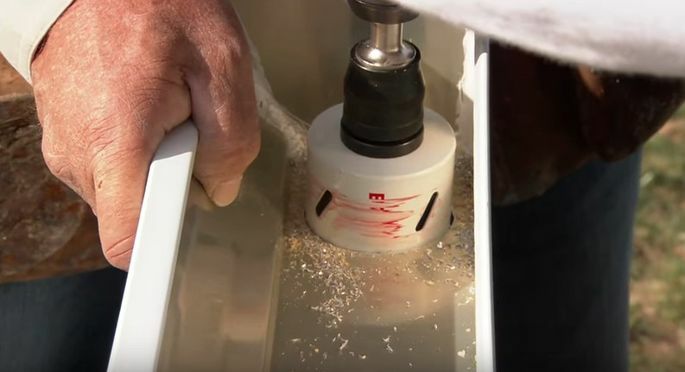 Using a hole saw drill bit, drill a 3-inch-diameter hole through the bottom of the gutter. Attach an outlet fitting in the hole using sealant and rivets. Hecox suggests hanging gutters in sections. Set up your extension ladder where you're going to start hanging. Place a ladder stabilizer on the roof. Hold the gutter in place against the house fascia. 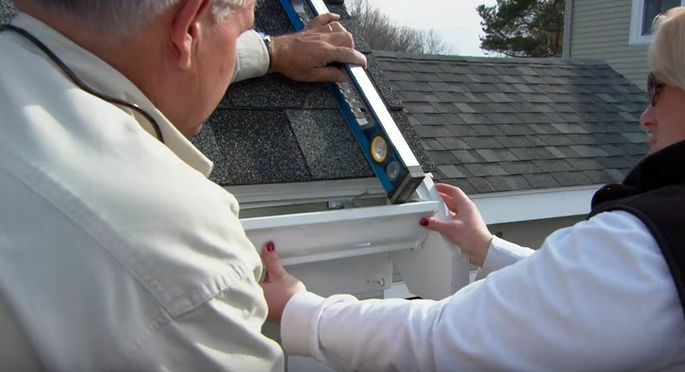 To prevent it from being too high, hold a level on the roof so it extends down to the gutter. If it hits the front edge of the gutter, it's too high. If the gutter is too high, it could get ripped off once it's filled with rain or snow. 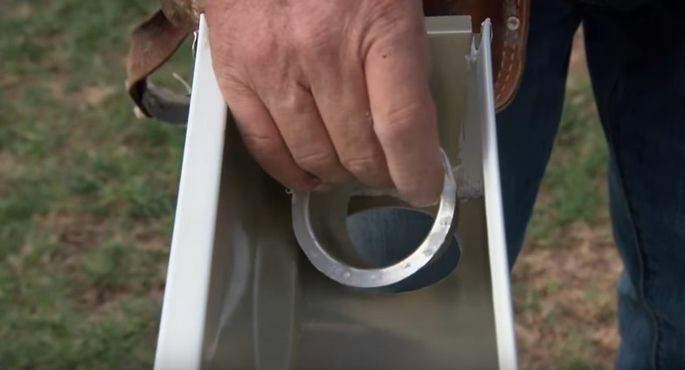 Once the gutter is in the right place, place an aluminum hidden gutter bracket in the high end of the gutter and drive a screw through the bracket into the fascia to hold it in place. Because water runs downhill, gutters need to be sloped to allow rainwater to run through them. 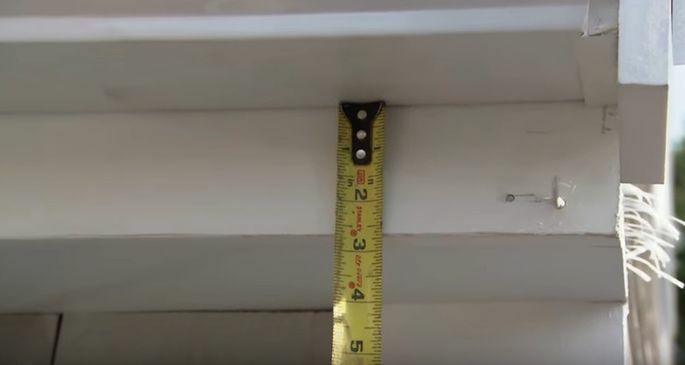 Measure the bottom of the gutter to the bottom of the fascia. Go to the other end of the gutter and measure from the bottom of the gutter to the bottom of the fascia, and then pull it a half-inch lower. That will allow the water to run down the gutter. Allow a half-inch slope for every 15 feet of gutter. 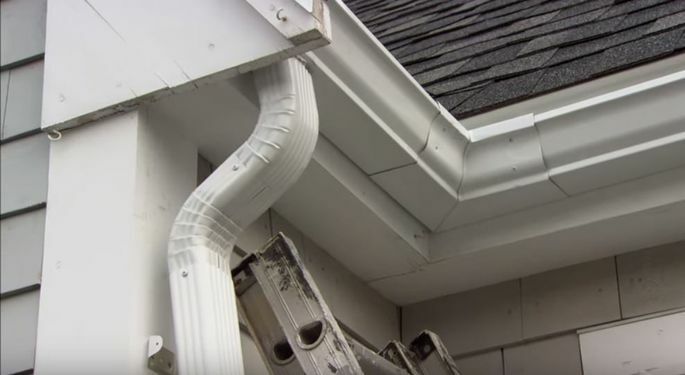 Once the gutter is properly slopped, add another hidden gutter bracket in the middle of the run, screwing it into the fascia. Continue placing and screwing hidden brackets every 3 feet along the run, maintaining the slope. Place two elbows on the upper end of a length of downspout, securing them with self-tapping metal screws. Screw two aluminum wall brackets to the house trim boards—one at the top, slightly below where the gutter elbow will be on the downspout, and one at the bottom, where the bottom elbow will be. 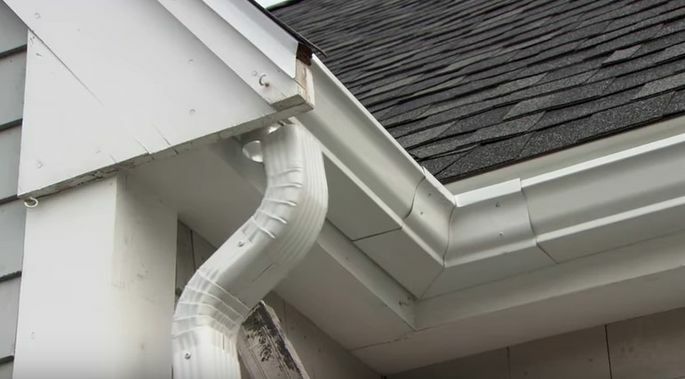 Put some gutter sealant on the outside of the downspout outlet, and slip the elbow on the upper end of the downspout over the outlet fitting protruding down from the gutter above. 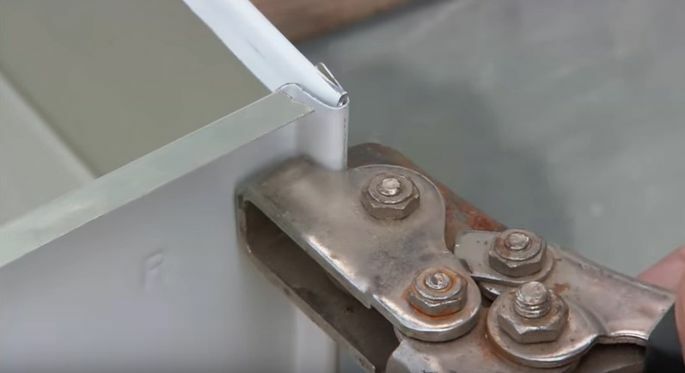 Secure the downspouts in place using self-tapping metal screws through the wall brackets.